Hello fellow nasturtium growers and admirers! 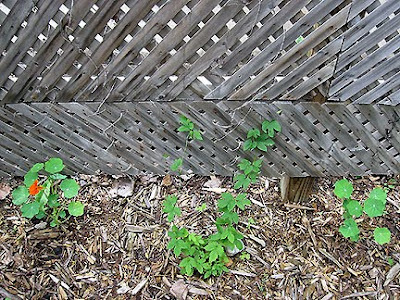 This is my fourth post for the Seed GROW Project, organized by Mr. Brown Thumb, with nasturtium seeds (Tropaeolum majus 'Spitfire') donated by Renee's Garden. Only three of my nasties (which by the way is a term of endearment) made it this year. But as you can see, one of them is already blooming. Looking very well after all the rain, noogie! I placed two plants along the trellis that divides one of my garden beds from my neighbors' driveway. The plant in between the nasties is hops. A local brewer gave it to me last year and it never did much. In fact, I thought it had died. Then this year, hey presto!, it's growing. I think it will be a nice contrast to the orange nasties. 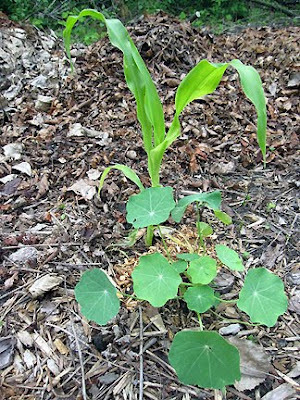 Here is my winter-sown heirloom corn, Golden Bantam, which I think the nasty will look nice surrounding or climbing up, as it sees fit. You may be thinking I'm picking strange plant companions for my nasties, and it's true I like to mix it up. Mother Nature is with me on this one. 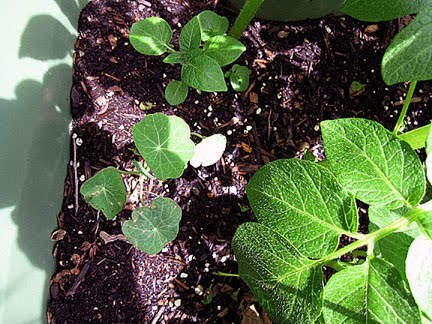 I found a fourth nasturtium growing in my container potatoes about a month ago. Somehow the soil in which the other nasties didn't sprout must have gotten mixed up in this soil. I did very carefully try to extract the nasty a few weeks later from what was then a potato forest, but I didn't get enough roots and lost the patient in a failed nastectomy! So that's me then. How are your nasties doing? 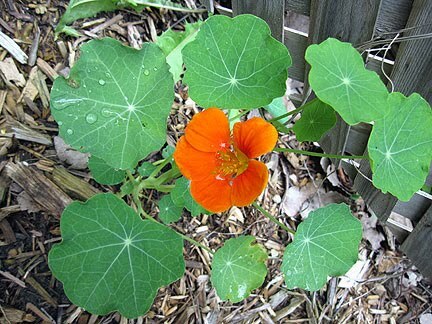 I'm growing Nasturtium 'Spitfire' for the GROW project. Thanks to Renee's Garden for the seeds. I have nasty urchins coming out of my ears at Tumbledown. I didn't sow any this year, they are all the babies of last years beasties. Steadily over the last few weeks they have been poking their heads through the soil. I think they are planning a revolution as given the rate at which they are appearing I suspect they will soon take over the entire veg plot! I might have some nasties by my house foundation. I can't decide if they are nasties or baby hollyhocks. Hmmm time will tell. I've got pretty much 100% propagation on them, despite sticking them in places where nasturtiums don't like to grow (i.e. crowded and shady spots). Love the color and symmetry of the one that's blooming! Check out my progress with them on today's post. Hi Monica....love the combination of hops and nasties.....lovely. I grow hops, I might just add some nasties alongside. Mine at the moment are doing very well but I do find them very unpredictable. I love them and grow them from seed every year. The red data list is plants that are endangered, threatened or vulnerable. No nasties for me. My sunny spots are pretty much filled, but I would lkie to try them. I have some nasties growing in my window boxes on my shed. My only color so far is orange. That must be a prevalent color for them. I do hope some of the others will be different in color. Cool - a bloom already! Yours is the first I've seen blooming - you win the prize! ;) Such a great color. My nasties are looking pretty happy now after a shaky start - looking forward to seeing some blooms soon. A very pretty orange indeed! I'm jealous that you already have a flower! Mine are completely flower free so far. Mine are just about played out. They don't make it through the summers here. I'm looking forward to see yours climbing! You can never have too many of them. Blogger is certainly doing odd things today. It's just published my comment twice but there's no symbol for deleting the spare. nasties?? but I LOVE nasturtiums. I have them popping up all over this year, self seeded in odd places but I'm keeping as many as I can (my love is not shared by my hubby). Especially delightful is the one that is growing under the rickety old stepladder in the squash bed. I have high hopes that it will twirl around the ladder and up, up, up. I want to grow hops too! I saw some at that beer thing and thought there were the coolest. Hi Monica, I guess it was good that I started so many seedlings in little newspaper pots!! ;-) I'll be posting soon - but I have to get a photo of "my other (a short-lived secret) spot!" ha. At least you have one that's flowered! I've got one trailing out of pot, it don't look all that good, but maybe it's because it don't like how I'm letting it "go." I planted a few more seeds today, late I know, but maybe they'll do more than the one in the pot. So far, 'Spitfire' hasn't impressed me much. Looking good!! Do you use the hops for brewing?